Memes are stupid. Memes are dangerous. As fun and often humorous as these passed-around images on the internet can sometimes be, memes are one of the multitude of things that are causing society to become more divisive and decay faster into an unrecognizable mass of dung. What’s worse is that lamentably everyone uses memes. Liberals use them against Conservatives, Conservatives against Liberals, Atheists against Creationists, Creationists against Atheists, or for any sociological, political, religious, philosophical or medical argument or cause that exists. Participants throw them back at their opponents without even realizing that even though there may exist well-founded, rational arguments that supports their side, they still chose to use these extemporaneous – and often wrong – meme pictures instead, and not even realize that their employment may hurt their cause more than it helps. I dislike it whenever I see anything excessively proliferating that is flat-out wrong. Therefore, I’m going to start a series of posts debunking some of the most inane and egregious anti-Christian memes I find on the internet. The first one I’ll tackle is one about Moses and the Exodus from Egypt. The snarky (and completely inaccurate) meme pic in question. 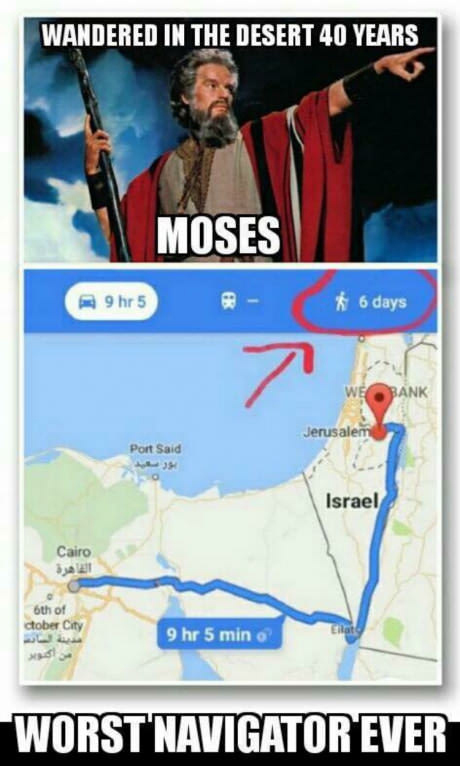 Some wise guy thought they could easily shame both Jewish and Christian believers by questioning the story of Moses and the Hebrew Exodus; this person opened the Google Maps app and punched in the estimated walking time between Cairo, Egypt and Jerusalem, Israel. It turns out that according to the app, the journey “only” takes six days to travel by foot. They made a cutesy meme pic and threw it up on the internet. Yep! That must disprove the whole story in the Bible as being an ancient fairy tale where its creators idiotically conceived some preposterous drivel about it requiring 40 years to trek to the Promised Land! 1. The estimation for a six-day journey is based on the notion that one is walking at the average maximum walking speed of 3 mph and have the stamina to walk for 24 hours a day the entire time during your journey. 2. There are no rest times, meal or bathroom breaks, time to sleep, etc. accounted for. 3. It assumes that you are traversing on modern, paved roads between Egypt and Israel. 4. You have adequate food, water, first aid and all necessary supplies for your entire journey across the rough terrain and desert, not to mention GPS or other navigational aids. “And the children of Israel journeyed from Rameses to Succoth, about six hundred thousand on foot that were men, beside children. And a mixed multitude went up also with them; and flock, and herds, even very much cattle.” (Exodus 12:37-38). 1. It states that there were 600,000 Hebrew men numbered in the Exodus. Once you add women and children, the total number of Hebrew people could easily reach past 1 million in upwards of 2-2.5 million or even 3 million. That’s a pretty hefty mass of evacuees to navigate as one, cohesive group. 2. There were no doubt a sizable number of elderly folks in these estimations. Add in those who had physical ailments like leg, hip and back problems that prevented them from walking at a fast pace. Oh, and let’s not forget slow-moving pregnant and nursing women who no doubt needed frequent rests. Lastly, throw in younger children, and you have an enormous sea of humans who can neither travel very fast nor can cover very much ground daily. 3. The Israelites brought with them out of Egypt an unnumbered amount of domesticated animal herds with them, which probably included creatures such as cattle and sheep. Another facepalm-inducing, anti-Exodus meme with no basis in facts or logic. If the meme creators (or anyone who shares or blindly agrees with the memes, for that matter) would have simply cracked open a Bible or did some research on the matter, they would immediately figure out that they have no historical or logical legs on which to stand. “1 These are the stages of the people of Israel, when they went out of the land of Egypt by their companies under the leadership of Moses and Aaron. 2 Moses wrote down their starting places, stage by stage, by command of the Lord, and these are their stages according to their starting places. 3 They set out from Rameses in the first month, on the fifteenth day of the first month. On the day after the Passover, the people of Israel went out triumphantly in the sight of all the Egyptians, 4 while the Egyptians were burying all their firstborn, whom the Lord had struck down among them. On their gods also the Lord executed judgments. 8 And they set out from before Hahiroth and passed through the midst of the sea into the wilderness, and they went a three days’ journey in the wilderness of Etham and camped at Marah. So that was a lot of sojourning, stopping to rest and camp, and then continuing on. As you can imagine, for a mass of 1.5 to 3 million humans, it took quite a long time! Well, many scholars have been able to calculate the traveling times and have developed chronologies to a fairly accurate degree. The ridiculously comprehensive archeology section of the Bible.ca site [http://www.bible.ca/archeology/bible-archeology-exodus-route.htm] has one exhaustively-researched page after another that documents places and times for the Exodus that I could barely scratch the surface of here in any adequate summarization. Just bookmark it read it for yourself. 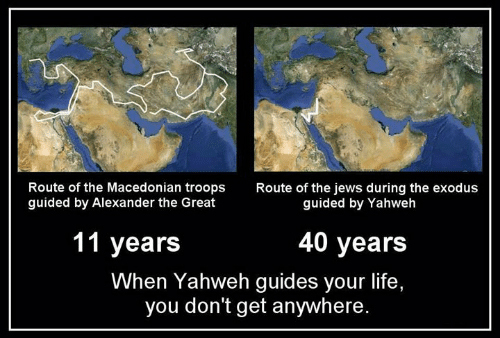 Instead of that, I’ll give you the gist of how long the journey took from Egypt to just shy of Canaan, AKA the Promised Land, which would eventually become Israel. In earlier chapters of Numbers and the Book of Exodus we get some pretty solid timeframes listed. According to Exodus 12:2 and 6, his whole Exodus started in the city of Rameses on the 14th day of the first month. Moses and the Hebrews then proceeded to Succoth in Egypt (Exodus 12:37), and that night they began their trek out of the country of Egypt, according to Exodus 12:40-42 and Deuteronomy 16:6. 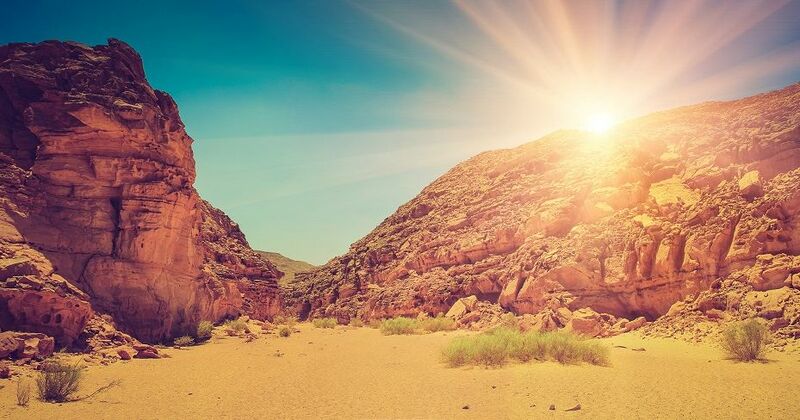 The first stage of the journey comprised of leaving Succoth, travelling through the Wilderness of Red Sea, and then on to Etham (Exodus 13:18-20). The Israelites made an encampment at Pi Hahiroth, “between Migdol and the sea” (Exodus 14:2). After crossing the Red Sea (Exodus 14:21-22), Moses and company took a three-day journey to Marah (Exodus 15:22-23). The next rest was Elim (Exodus 15:27). They then reached the Wilderness of Sin. According to Exodus 16:1, the total elapsed Exodus time was around 30-31 days (“the fifteenth day of the second month”). From there, the next destinations were Rephidim and then Sinai. Another thirty or more days had transpired at this point (Exodus 19:1-2). There at Mt. Sinai, God gave Moses and the Israelites His Law, instruction and covenant. From this point, we cover the rest of the Book of Exodus, Leviticus, and the first several chapters of Numbers with God’s Law, and the building of the Tabernacle and the Ark of the Covenant. They spent about one year here at Sinai (Numbers 10:11). When it was time to pick up and begin travelling again, The Israelites undertook a three-day jaunt to Taberah/Kibroth Hattaavah (Numbers 10:33, 11:3). The following encampment was at Hazeroth (Numbers 11:35), and stayed there at least seven days (Numbers 12:15). From there they came to Kadesh Barnea in the Wilderness of Paran (Numbers 12:16). This stop at Kadesh Barnea was an important one, for it bordered the Promised Land of Canaan, which would eventually become the country of Israel. Yep, the Hebrews were in striking distance to where God was ultimately leading them. They were close enough that they sent out Twelve Spies to survey the land and its people (Numbers 13:18-25). So from Rameses in Egypt to Mt. Sinai was approximately two months. The time spent at Mt. Sinai was about one year. And the remaining leg of the Exodus before the dispatching of the Twelve Spies was at least ten days, and possibly two weeks, all for a grand total of roughly 1 year and 2 1/2 months. The rough, rocky and arid terrain of the Sinai Peninsula. This is a shot of the Colored Canyons near Nuweiba, South Sinai, Egypt. 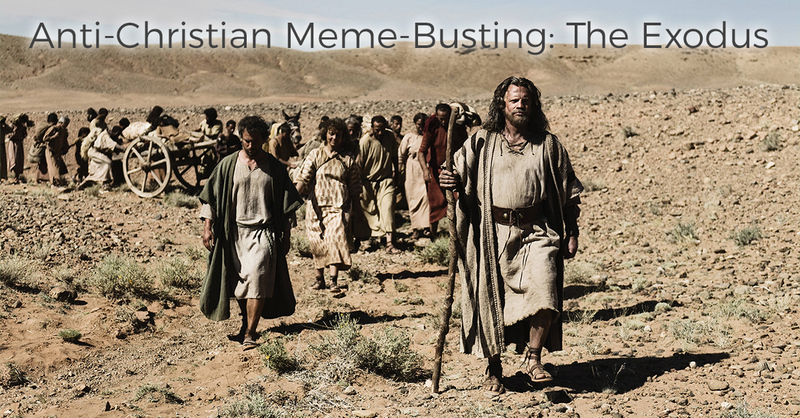 Here’s a well-known fact that the paper-thin atheist debaters have ignored when propagating these memes: that God had punished the Israelites by making them walk back out into the desert for 40 years, often referred to as the Wandering in the Wilderness. It certainly wasn’t poor navigation like the meme implies. In Numbers 13, the Lord commanded Moses out twelve spies to survey the land and its people (verses 18-15). After forty days of exploration, the twelve returned with their reports. Ten of them had highly negative statements about Canaan. They exclaimed, “we can’t attack those people; they are stronger than we are…All the people we saw were of great size…We seemed like grasshoppers in our own eyes” (Numbers 13:31-33). Two of the spies, Joshua and Caleb, had good reports of the Promised Land (Numbers 14:6-7). The Hebrew people chose to listen to the ten doubters instead the word of the Joshua and Caleb and the promises of God, and rebelled. They grumbled and complained and “raised their voices and wept aloud,” against Moses and Aaron, lamenting, “If only we had died in Egypt! Or in this desert! Why is the Lord bringing us to this land only to let us fall by the sword?” (Numbers 14:1-2). This doubting and rebellion angered the Lord God. He was about ready to destroy them with a plague (Numbers 14:11) until Moses intervened and asked the Lord for forgiveness (Numbers 14:13-20). God honored Moses’ request and forgave the Israelite people, but still thought punishment on a smaller scale was necessary. He decided that “not one of them will ever see the land I promised on oath to their forefathers. No one who has treated me with contempt will ever see it” (Numbers 14:23). Rather, they would suffer by wandering in the wilderness for forty years, one year for each of the forty days they explored the land (Numbers 14:34). Furthermore, God would give them what they asked for: “I will do the very things I heard you say: In this desert your bodies will fall, every one of you twenty years old or more” (Numbers 14:28-29). Out of the Twelve Spies, only Joshua and Caleb survived, being faithful and believing in God’s promise to give the land over to them. After hearing of God’s punishment, some of the rebellious Israelites went towards where the spies came from in the hill country, but were attacked by the native Amalekites and Canaanites and beat them back (Numbers 14:39-45). The rest of the Pentateuch (the remaining chapters of Numbers and Deuteronomy) document further exploits and instructional education of Moses and the Israelites until forty years had transpired and they were able to enter the Holy Land. Here’s the “TL;DR” version: Moses and the Hebrews made dozens of stops, spent a year at Sinai, arrived near the Promised Land in a little over a year, and were punished by God and were forced to wander back out in the desert wilderness for 40 years. For all of you sharing and liking these unresearched memes…just stop. Seriously. You’re not doing your side any favors. Take some time to see if there is any validity to what you’re arguing against. Do you have any additional thoughts on this matter? Are there any other memes or myths that you would like be tested and busted? Contact me or leave your comment below! Your pathetic. Worshipping your sky daddy. Get out of your fairy tail world, Roberts. The Flying Spaghetti MOnster will rule all of the magic earth Kingdom! Please refer to the millions of immigrants in circumstances similar to those you have described above, that have travelled much further from Africa, to descend upon Europe. It took them weeks and months at most. Refer also to the migration from Central America to the USA. Similar numbers and circumstances, but still only days and months. P.S. And quoting the Bible as proof of the Bible is just intellectual dishonesty allied to wilful delusion. John, going by your comment, it’s crystal clear that you didn’t even bother to read the article. I even wrote a “TL;DR” explanation towards the end for people like you. Please try doing that next time, and you just might learn something. Have a great day.